Snell Family Farm is a diverse, fourth generation farm producing plants, fruit, herbs, cut flowers, and vegetables, selling directly to the customers. Our farm in Buxton is open daily from early May to Thanksgiving. We also attend Portland Maine Farmers' Market. Pick-Your-Own raspberries and apples in season. 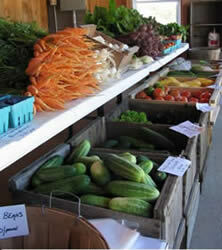 Snell Farm specializes in potatoes, cucumbers, tomatoes, cole crops, sweet potatoes, garlic and herbs, among other crops. Also specialty cut flowers . seed garlic, greenhouse crops including bedding plants, vegetable seedlings, hanging baskets, and perennial plants. Snell Family Farm offers a variation of Community Supported Agriculture (CSA), whereby customers prepay for farm products and receive a 10% discount for their support. This gives the Snells some operating capital before the season and makes shopping convenient for the customers. With the money discounted 10%, $90.00 buys $100.00 credit, $180.00 is worth $200.00, $270.00 becomes a balance of $300.00, and so on. If the balance is not used up in the course of one season, the money is carried forward to the next year or refunded at the customer’s request. If the balance is depleted early, a member may recharge the account. We will extend the 10% discount to the amount paid ahead after covering any overdraft.